Good Morning!The White Sea Bass are still biting! Our Boats tanks are full of Live Squid! We have available spots open party overnights scheduled all week starting Monday! Our Open party schedules have changed to accomedate for all of your needs! The new schedules are up for the spring! All prices are Ticket price only. Meals, License, tackle are not included. Get those reservations in ASAP! Welcome Aboard! 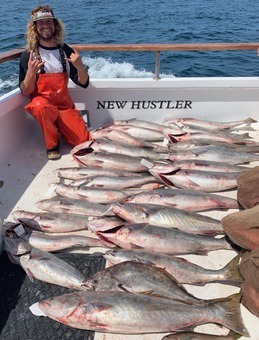 Hooks Sportfishing is a 4th generation family operated business that specializes in providing the finest in saltwater sport fishing experiences in the Channel Islands. We offer open party and private charter trips for all occasions! Whether you are looking for an exotic outer island overnight or multi day adventure to local freelance half and 3/4 day trips, we stand ready to help make unforgettable memories that will last a lifetime!